Carlos and Carole Ghosn, wearing outfits similar to the ones from their wedding party at the Palace of Versailles. That’s about $57,000, at current exchange rates. Most allegations of wrongdoing toward Ghosn have come from the Nissan part of the Nissan-Renault-Mitsubishi alliance, with Renault keeping Ghosn on as CEO from jail long after Nissan and Mitsubishi gave him the boot. That makes the Renault allegations big, although the statement doesn’t give many details aside from that the company decided to take its findings to authorities. Renault also didn’t specify what it thinks the $57,000 was used for. But Bloomberg cited unnamed sources in reporting that Ghosn might have put it toward a massive, fall 2016 party, which Town & Country Magazine wrote was a celebration of his marriage to second wife, Carole Ghosn, and her 50th birthday. 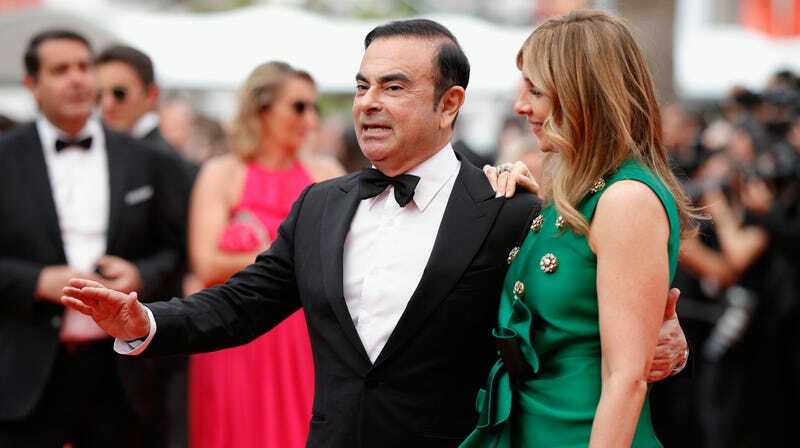 The sum is the estimated cost of renting the premises under a contract signed by Ghosn that entitled the carmaker to hold corporate events at Versailles, according to a person familiar with the matter who asked not to be named because the information isn’t public. Using the castle for his 2016 nuptials didn’t likely benefit the company, the person said. Renault’s disclosure marks the first time the carmaker has provided details of potential wrongdoing by the fallen executive after allegations of financial crimes were brought against him by Japanese authorities. The findings stem from an internal probe Renault started in November, shortly after Ghosn was arrested in Tokyo. The same sentiment probably doesn’t apply to jail, but, you know. But when it comes to weddings, most sensible married people will offer a couple of tips to those planning the big day. For one, don’t go into debt for a six-hour party that most people won’t remember aside from the food, and two, it’s not worth it to end up sleeping on a mat in jail just to avoid some additional costs. Cheese trays aren’t that memorable, after all. Carlos Ghosn Planned to Remove Nissan’s CEO Before He Got Arrested in Japan; Weird, Right?